A provocative hypothetical question: What if the Moon was not there? Video follows. This giant rock lights up the night and can even change colors. So what would we do without it? Would we all need night vision goggles? How would it affect the ocean tides? Our seasons? Or our sleep cycles? Or would the consequences be far more drastic? This is a treat. On Jan. 21st, a meteoroid slammed into the Moon. We know this because many amateur astronomers witnessed the explosion and recorded video and photos. 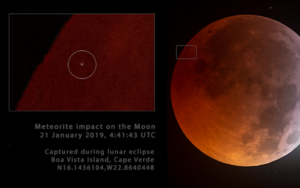 The fireball was visible against the shadowy backdrop of a total lunar eclipse. Video of the event follows. Lets all bow to the IPCC — a modern God that shalt not be questioned. The Holy Sacred Climate Cow! The IPCC is an unaudited and unaccountable foreign committee. Not only are no scientists paid to check its findings, now the publicly mandated BBC is making sure none of their journalists will check its findings either. Carbonbrief has a copy of the BBC new internal guidance on how to report climate change. In April, the UK regulator, Ofcom, found the BBC was guilty of not sufficiently challenging Lord Lawson, a skeptic. So in response the BBC now promises they will never sufficiently challenge the IPCC. That’s “false balance” for you. We found direct and definitive evidence for surface-exposed water ice in the lunar polar regions. The abundance and distribution of ice on the Moon are distinct from those on other airless bodies in the inner solar system such as Mercury and Ceres, which may be associated with the unique formation and evolution process of our Moon. These ice deposits might be utilized as an in situ resource in future exploration of the Moon. The valley networks of Mars bear a strong resemblance to those found in arid landscapes on Earth. Researchers have been able to demonstrate this using the branching angles of river valley confluences. Based on these observations, they infer that Mars once had a primeval climate in which sporadic heavy precipitation eroded valleys. In early 2017 scientists announced the discovery of possible desiccation cracks in Gale Crater, which was filled by lakes 3.5 billion years ago. 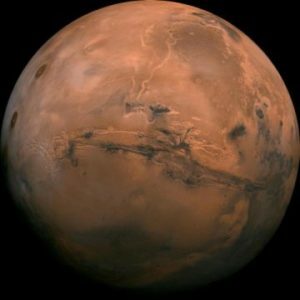 Now, a new study has confirmed that these features are indeed desiccation cracks, and reveals fresh details about Mars’ ancient climate. “We are now confident that these are mudcracks,” explains lead author Nathaniel Stein, a geologist at the California Institute of Technology in Pasadena. Since desiccation mudcracks form only where wet sediment is exposed to air, their position closer to the center of the ancient lake bed rather than the edge also suggests that lake levels rose and fell dramatically over time.